Yuri Kochiyama, a human rights activist dedicated to social justice through her participation in America’s civil rights movements for more than 50 years, will be presented with an honorary doctor of humane letters degree at commencement ceremonies for California State University, East Bay’s College of Letters, Arts, and Social Sciences at 9 a.m. Saturday, June 12. Born in San Pedro, Calif., Kochiyama spent two years in a Japanese American internment camp in Arkansas during World War II. Following the war, she moved to New York and married Bill Kochiyama, a veteran of the famous all-Japanese American 442nd combat unit of the U.S. Army. Her activism began in Harlem, NY, in the early 1960s when she participated in the Asian American, Black and Third World empowerment movements that promoted civil and human rights, called for creation of ethnic studies academic programs, and protested the war in Vietnam. She was a close friend of Malcolm X and joined his Organization for Afro-American Unity to work for racial justice and human rights. Kochiyama was in attendance at the Audubon Ballroom in Harlem when Malcolm X was assassinated Feb. 21, 1965, and is forever immortalized in a Life magazine photo that shows her holding him in her arms as he lay dying. 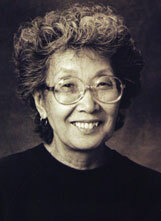 Kochiyama’s civil rights work includes her involvement as a member of Asian Americans for Action and the Harlem Parents’ Committee. She also has been involved in anti-apartheid organizing and has supported Puerto Rican independence and other international liberation struggles. In the 1980s Kochiyama, along with her husband, worked in the redress and reparations movement for Japanese Americans interned during World War II. She has also taught English to immigrant students and volunteered at soup kitchens and homeless shelters. Kochiyama has won numerous awards, been nominated for the Nobel Peace Prize (2005), spoken at more than 100 schools and colleges around the U.S., and been featured in several books and films (including “Yuri Kochiyama: Passion for Justice” and “My America: Honk if You Love Buddha”). She was featured in a 2001 television documentary, “Cool Women,” directed by Debbie Allen, and a biography on her life, “Heartbeat of the Struggle,” was written by Diane Fujino and published by University of Minnesota Press in 2005. Kochiyama is one of three people who will be honored at the university’s commencement ceremonies. CSUEB announced in mid-April that East Bay area businessmen and philanthropists Jack Acosta of Danville and Sil Garaventa Jr. of Concord would each be presented with honorary doctor of humane letters degrees. Acosta will receive his during ceremonies for CSUEB’s College of Business and Economics, while Garaventa is tentatively scheduled to be honored at ceremonies on the university’s Concord Campus. Yuri Kochiyama is the mother of six children, grandmother to nine and great-grandmother to four. She resides in Oakland.